Aichan is a small ruin on The Laughing Coast where the law-breakers of Mania are sent. It contains only one zone, Aichan Prison. 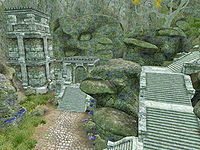 It is a prison guarded by Grummites, similar to Corpserot Passage. This is where the Golden Saints will throw you if you are arrested. 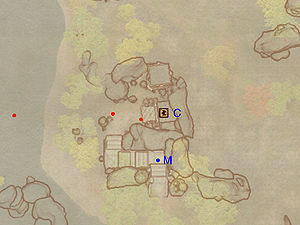 This ruin contains 18 Flame Stalk plants, 3 Screaming Maw plants, 4 Watcher's Eye plants, and 17 Root Stalk plants. To get past the doors at K and L you must commit a crime in Bliss then go to jail. You will then appear in the sealed-off section. This location's map marker (M on map) is named Aichan. The entrance door is N of the marker, 60 feet away. A bowl-shaped object labeled 0007131a can be seen floating high above the ruin's entrance. Its position is likely an error and its intended purpose is unknown. 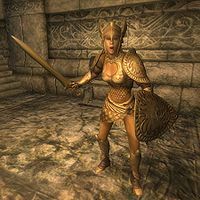 After being arrested by a Golden Saint you will find yourself in a cell near the bedroll at b, stripped of all your weapons and armor. Loot the urn (C) for a weapon and locate the push button that will lower the wall at O. 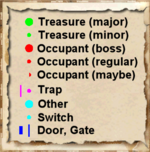 In the next room you will have to decide whether to go through gate L or N, as it will close behind you. Whichever route you take, you will be able to backtrack and claim any loot you may have missed. Through door L, the path is fairly linear: just make your way through the root tunnel, taking care to avoid the concentrated root worm traps at E, the occasional spore pod trap at F and the once-again concentrated root spikes traps at J. Loot the madness ore deposit at M and prepare for a fight with the prison guard. If you went through door N, the path is again linear. Avoid the fire from the four hunger statues at G and jump across the trapped floors at H. If you do fall down, you will be hit by dart traps (I) and face a grummite; but you will be able to loot an urn. Before entering the final room, make sure to heal as you are about to face the prison guard. Immediately make a run for the Evidence Chest at D and claim all of your belongings back, making it much easier to dispose of the guard. 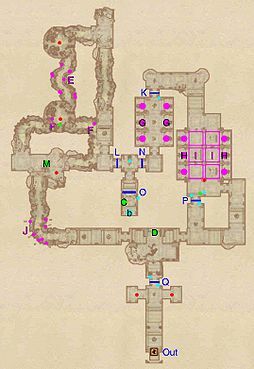 Once the fight is over, open gate Q by activating the push block nearby (cyan dot on map) and proceed up the stairs to your freedom at Out. This page was last modified on 3 June 2017, at 18:43.